Jack D. Sobel, M.D. is Dean and Distinguished Professor of the Wayne State University School of Medicine, and Chair, Wayne State University Physician Group. 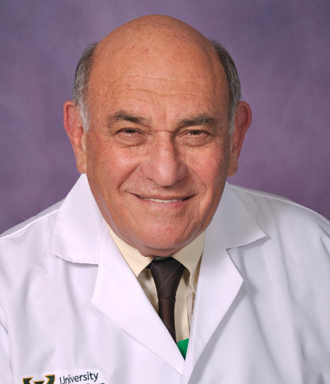 Dr. Sobel is a longtime member of the School of Medicine faculty, with extensive experience in both clinical practice and medical administration. A 1965 graduate of the University of the Witwatersrand, Johannesburg in South Africa, he served as a research fellow in Infectious Diseases, Laboratory of Clinical Investigation, National Institute of Allergic and Infectious Diseases, with the National Institutes of Health, and as a fellow in Infectious Diseases at the Medical College of Pennsylvania. He joined the Wayne State University School of Medicine as a professor of Internal Medicine in 1985, and was named chief of the Division of Infectious Diseases. Dr. Sobel has also served as the Associate Chair of Research in the Department of Internal Medicine before being named Chairman of Internal Medicine in 2014. He is a professor of Internal Medicine, Immunology and Microbiology, and Obstetrics and Gynecology. One of the world’s foremost authorities on bacterial vaginosis, Dr. Sobel is a widely published and strongly funded physician-researcher. He has been involved in basic science, translational and clinical research since the inception of his Infectious Diseases Research Fellowship in 1976 at the NIH Laboratory of Clinical Investigation. He has served as a consultant for the U.S. Centers for Disease Control and Prevention’s special committee for recommending guidelines for the treatment of sexually transmitted diseases. He also served as president of the Michigan Infectious Diseases Society from 1997 to 1999, and is a member of the Infectious Diseases Society of America, the National State President’s Committee and the Infectious Diseases Society of America, Practice Guidelines Committee. He received the Golden Apple Award for best clinical teacher in 1979 and the Medical House Staff Award for Excellence in Clinical Teaching in 1984 at the Medical College of Pennsylvania. He was given the Distinguished Faculty Award from the Wayne State University Department of Internal Medicine in 1986 and the School of Medicine’s Teaching Award in 2004. In 2008, he received the Gershenson Distinguished Faculty Award, and in 2011 was elected to the Wayne State University Academy of Scholars. Dr. Sobel has been consistently named a Best Doctor in America since 1998, a Top Doctor since 1995, and a Super Doctor since 2011. Lamont RF, Nhan-Chang C-L, Sobel JD, Workowski K, Conde-Agudelo A, Romero R. Treatment of abnormal vaginal flora in early pregnancy with clindamycin for the prevention of spontaneous preterm birth: a systematic review and metanalysis. Am J Obstet Gynecol. 2011 205:177-90. PMID: 22071048.